1) it would be too big and heavy to be delivered to most backyards. An oven with a 40" cooking area would be 55"x60" on the outside easily weighting in at 1800 lb. 2) cost would be a lot higher - incl. cost of specialized delivery with a crane, see above. 3) assembling the kit yourself allows you to finish it with any veneer that you want: stucco, tiles, flagstones, etc. 4) and finally - food tastes differently when you know you built the oven yourself! It's a fun and engaging project which start with a hole in the ground and ends with delicious crusty pies! For complete demonstration of all steps this presentation has been compiled from a few different projects all of which used the Volta pizza oven kit. No matter which kit you choose the main steps - and even most details - are the same and once you've done it once you will become a pro to your envying friends and neighbours! It all starts with a hole in the ground. An oven that will last for generations will need a strong foundation. 1. Establish the area you will need for your oven's base. For an oven with a 40" diameter you will likely need an area of 55" wide by 60" deep. This is approximate and varies from oven to oven. Include the room you need for insulation and your choice of veneer (stucco, bricks, stones, etc). Once you have the size figured out draw area border on the ground and... dig! You will want to make a the footing 6"-8" deep. Fill it up with gravel and then through some sand on top and flatten it out. It's ok if this area is not perfectly flat - it usually isn't, this is only the foundation to support the cement footing. 2. Now, the footing. You will need to construct a frame from 2x6s following the borders of your area. Connect the 2x6s with screws. Place metal rebars inside both ways (front to back and left to right), try to keep 8" to 12" between parallel rebars. The rebars should not be sitting directly on the sand! They should be at least 2" off the ground, you can easily achieve this by placing the first layer on 2x4s inside the frame. The rebars should span almost the entire inner width and depth of your frame - you can keep them 2" away from each side of your frame (2x6s). Now, the cement... You will need to mix and pour a lot of Portland cement. Fill up your frame from 2x6s completely - to the top and even add a little extra which will be removed in the next step. Step 2: Building the Base From Cinder Blocks. Cinder blocks are the best materials to build the base from. They are strong, inexpensive, and BIG = less mortaring than the much smaller bricks. The most common size of cinder blocks in the US is 16x8x8. We highly recommend a height of 40"-44" for the cooking area, this will make your cinder block base either 4 or 5 blocks high. Use the level when building the walls. The oven base does need to be reinforced with metal bars standing vertically as pictured - and cement inside the blocks. Some people will fill up each hole and others only every second one. Pay close attention to the pictures, you will see that the blocks in each layer are NOT be placed in the same order! Use "half blocks" to start a new layer in a different pattern to make sure the blocks in this layer will NOT join directly above the joint of the layer below. This is critical for stability and is easily achieve with "half blocks" - just start every second layer with a half block and every other layer with a full block. Once your base is done allow it to cure for a few days. The next step is to build the weight bearing slab on which the oven will sit. Step 3: Building the Weight Bearing Surface for Your Oven. Place a steel sheet on top of the 3 walls of the base. You can usually buy one from a local metal fabricator. It has to be sufficient grade to hold the weight of the oven + your veneer. You can use a combination of 2 sheets side by side, for instance two 30"x55" sheets for a 60"x55" surface. This will make it easier to deliver and handle them. They doesn't have to be secured to the base - the weight of the oven will hold them firmly in place. On top of the metal place cement board (for instance Durock). It comes in half inch thickness, make 8 layers for a 4" total cement thickness. That's it, your surface is built. This is WAY quicker and easier than the process described below. You can see a sheet metal support for an oven we built on a pub's patio (the red one). Ok, if you are going the traditional way you will need to construct your timber frame first. 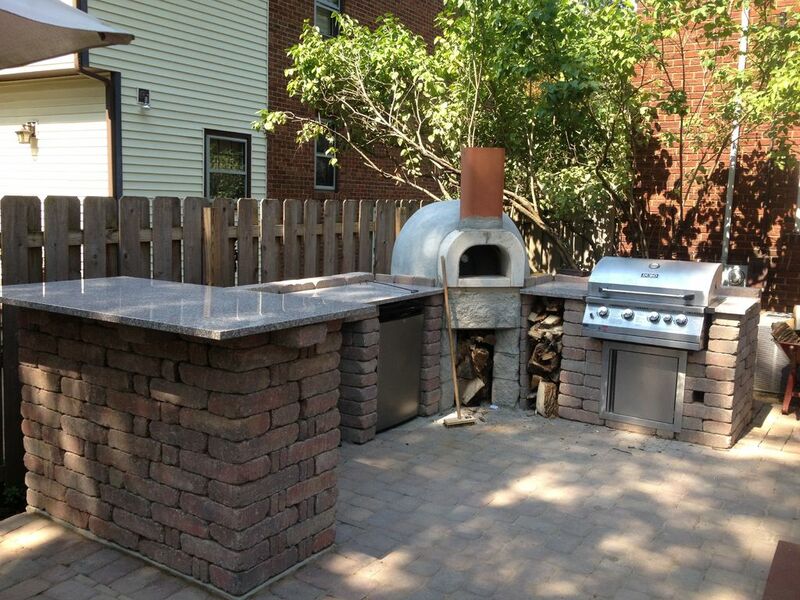 It will host the cement slab for your oven. Pictures will tell better story than words. Use 2x6s on the sides. The frame is later dismantled and removed (obviously just the sides, you won't be able to remove the bottom parts), so don't worry about a combination of a wood fired oven and a wooden frame )). You will also need to cover the entire inner area of the base (between the cinder block walls). You can do this with plywood. The trick is that this piece of plywood has to be very well supported from the ground - or else it will fall when you pour cement into it. You can support it with cinder blocks (of course you will later remove them). This slab will not be exposed to very high Ts and hence there is no need to use the $80 a bag refractory cement. Use regular Portland. More on this in the next step. Once your timber frame is sitting on the cinder block walls and plywood is in place you will basically need to repeat the process from Step 1 - the foundation. Reinforce with rebars, mix and pour cement, level it, cover with plastic, wait for it to cure, please see Step 1 for more details instructions. Once you are sure everything is cured remove the supporting cinder blocks from under the plywood, then the plywood (or you can just leave it there if you wish), and the sides of the frame. You are now getting close to the oven itself! Step 4: Floor Insulation & Pizza Oven Kit Assembly. Before you purchase your kit please check that it comes with the cooking floor. Most kits do (like our Volta and Neapolitan kits), but just in case it's better to check. If for some reason your kit didn't come with a floor then you will likely want to use regular firebricks for your cooking floor - this is fine. Important tip: use the board only under the cooking area of the oven - where you will need the heat. Do not waste the expensive board on the sides just to make the surface level, you can use regular bricks for that. The board can be easily cut with a handsaw to fit the blueprint on your oven. And another important note: if your cement surface did not come out perfectly level then you will need to use ordinary sand to level it out and place the mineral board on top of the sand. Once the board is in place place the oven floor directly on top of the board. And then follow with the entire dome. Our Volta kits interlock and hence do not require any mortar on the joints - the whole assembly process can be done in 20 min. Some other kits will require mortaring the joints (like our Neapolitan kits). Use refractory mortar rated to 2000F. Ace Hardware carriers Rutland Fireplace Mortar and there are many others. Step 5: Insulating the Dome. Insulating the dome make sure that the heat is not lost but is kept inside for cooking. A well insulated oven will stay at 400F for 24 hours. Some ovens for a week! While you can use the old school sand and broken glass to insulate your oven we don't recommend. This will add a lot of weight to the structure and will not perform on part with modern day insulation materials. These days the materials used the most are ceramic fiber blankets and / or rock wool (mineral wool). If you are using ceramic fiber (Kaowool, Superwool, etc) then just wrap your oven in 3 layers of 1" blanket all around - you want a minimum 3" insulation on all sides. If you have blanket left over use it, the more the merrier, but over 5" i don't think it makes a noticeable difference. Blanket can be easily ripped by hand but make sure to wear gloves - fiberglass is itchy! What keeps the blanket in place is chicken wire / wire mesh. You can buy it from Home Depot for $13, size doesn't really matter. Your oven is now insulated but is still missing the chimney. This is what the next step is about! If you are building your oven under open sky then sky is the limit for the chimney. You can use a 12" clay pipe, a black stove pipe, a terracotta fireplace chimney, an insulated stainless steel chimney, a black stove pipe, or a brick stack! Remember that in the traditional Neapolitan-style oven the chimney is in front of the door, not behind it! Therefore you will need the arch to attach your chimney to. Our Volta kits do come with such arch. If your kit does not come with one you will need to build one from bricks, see one of the pictures on this page. If you are using a clay chimney just place it on top of the chimney opening in the arch, close the rest with clay bricks or firebricks, mortar the chimney to the oven and you are done. If you are using a metal chimney (whether double wall or single wall) you will need the matching anchor plate - usually sold at the same place where they sell the chimney. Make a base for the anchor plate from bricks as pictured. Place the anchor plate on top, fix it in place with screws or mortar. Twist lock your chimney to the anchor plate. That's it. if you are building your pizza oven indoor (good for you, i want one too but just don't have the right set up...) then the chimney process is the same as for a wood stove. Some details are provided here but this is not a complete guide. Now this is the area to be creative, don't let anything stop you! hard to believe that inside each oven pictured here is the same kit. You can use stones, bricks, tiles, copper, etc. If the oven is properly insulated with then the top of the blanket (chicken wire) will not be hot so don't be afraid to use whichever materials you like. This stand often requires involvement by a professional mason, it all depends on your budget. Thanks and we hope you have enjoyed reading this guide! Omg! I want my own wood oven! where did you get the flue? Thanks for the fantastic first Instructable! I hope we see many more from you in the future! Maybe some pizza recipes? I love the look of the end result. Truly amazing! If it was me, I would probably make one of the finished ovens the main picture to entice more people to take a look! Great job and welcome to the Instructables Community!